Livestream Studio can accept Mevo as a remote camera source when connected to the same network. Make sure that your Mevo is turned on and connected to the same local network as your Livestream Studio machine. If it is not connected to the same network (i.e. to the same access point), Studio cannot recognize Mevo. When Mevo is on your network, Studio will automatically detect it. There is no need to open the Mevo app to enable it as a remote camera. You must be on Studio version 6 and Mevo version 1.13 with the latest firmware. These are not compatible with older versions and do not support this workflow. When you launch the Mevo app and are connected to your camera's hotspot, you will see a prompt to Update Firmware if your camera is not updated. In Livestream Studio, navigate to the Inputs tab. 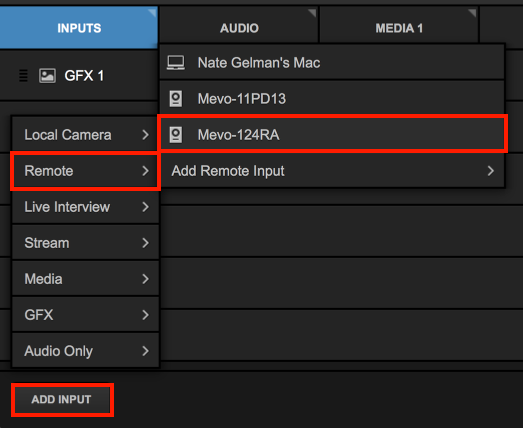 Select Add Input > Remote, then select your Mevo. You cannot start a separate stream or recording from Mevo while Studio Remote Camera Mode is enabled. Your Mevo will appear on the bottom of your Inputs list. You can rename it by hovering your cursor over its name and selecting the pencil icon that appears. You can select a different remote source by opening the drop-down menu. When your Mevo is connected, a status message will appear here as well (e.g. "Perfect streaming"). To further configure and control your Mevo, select the corresponding gearwheel icon to the right. Many of Mevo's basic settings in the Mevo app are configurable directly in Studio in the General tab. This includes the camera's name, resolution, frame rate, password protection, the Mevo button's setting, auto turn off, auto-wide on app disconnect, and speaker and LED ring settings. Any of these settings that you change in Studio will also be reflected inside the Mevo app. Keep in mind each setting will need a few seconds in order to take effect. 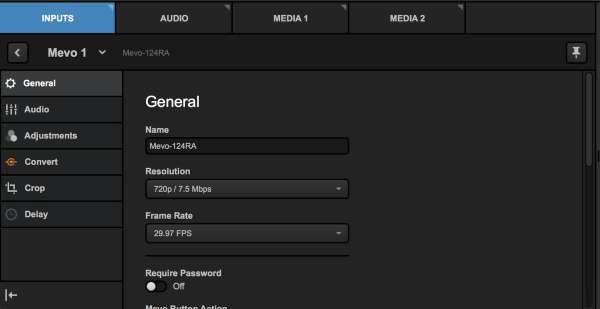 If you adjust the Mevo's resolution within Studio's input settings menu, this will cause the Mevo to restart. Do not change this setting inside Studio's inputs' menu if you are live or about to go live. In addition to these general settings, the Adjustments tab will allow you to customize the Mevo's image, including exposure, shutter speed, ISO, white balance, brightness, contrast, saturation, sharpness, view angle, exposure metering, image flip, electronic image stabilization (EIS), and anti flicker settings. These are the same settings found in the Mevo app's Adjustments menu and any changes made to these in Studio will be reflected in the Mevo app. Use the Crop functionality in Studio to adjust your Mevo's shot. 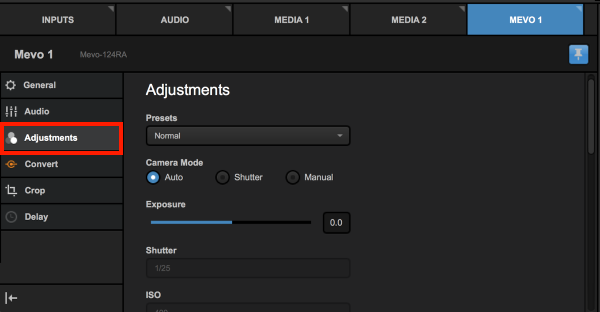 This allows you to configure up to four preset shots with motion and transition control. Studio does not include some Mevo features such as face detection, live follow, and auto-pilot; these features are only controllable via the Mevo app. If you do use these features in the Mevo app, you will not be able to control your Mevo shot inside Studio until you switch to a generic shot or wide shot in the Mevo app. You can still use the Mevo app to control your camera instead of Studio if you prefer. After adding Mevo as an input in Studio as described above, connect your Mevo app to your camera via Wi-Fi. You will notice the bottom left corner now shows a dark gray button indicating it is linked to Studio but is not currently in Preview or Program. If you tap this button, the option to push it to the Preview (PRV) or Program (PGM) monitors in Studio will appear. Use your finger to slide the gray button to either PRV or PGM to put your Mevo into either Preview or Program in Studio, respectively. Once Mevo is in the Preview or Program monitor, tap the button again and slide it to switch it between the monitors in Studio. While Mevo is being used as a Remote Camera in Studio, you may still live edit your Mevo shot in your Mevo app. This would include features such as face detection and live follow, but please note that while these features are in use, you will not be able to change Mevo's shot via Studio until you cut to a generic crop or a wide shot. Your Mevo will output all crops and edits to Studio. Additionally, whichever crop preset in Studio is activated will adjust to reflect the edit made in the Mevo App. Notice below, the cursor is not touching the Take / Edit buttons, but the orange box (Preset 1) crops anyway; this was an edit made inside the Mevo app. Selecting 1080p / 15.0Mbps will disable all Camera Assistant features (Face Detection, Live Follow, Auto Pilot, Static Shots). Panning and zooming via the Mevo app are also disabled, but you can cut/crop your shot or use the crop features inside Studio. Once your Mevo is connected, check here for best practices and recommendations for using Mevo as a remote camera source. If you've checked all the above steps and you are connecting over Ethernet, there could be a rare IP configuration issue.